With the arrival of autumn, I love the many different vegetables that are available. In my youth, I would never have touched an eggplant, and I probably didn’t know what it even was. 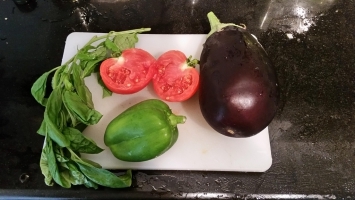 Now, I appreciate the sheer beauty of the many varieties of eggplants, and truly enjoy the flavor. My dear friend, Larie Engles, has shared this tasty dish with my family on many occasions. The recipe, that she has adapted originated from a childhood friend. Thank you, Larie! This entry was posted in Lookout Point Lakeside Inn, Vegetables and Potatoes by admin. Bookmark the permalink.